Updated July 28, 2018 – Executive Summary added. Updated July 19, 2018 – Ka and Ku-band information added. 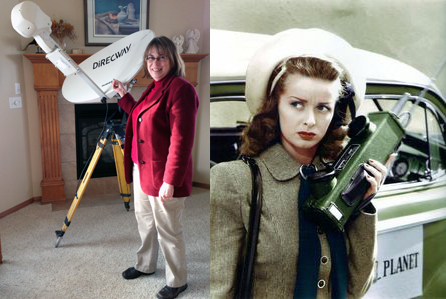 Overall Winner: Ka-band 25Mbps HughesNET Gen 5 .98M or .90M dish (~ $1500). This is my satellite Internet setup. Also, here’s my 1st evaluation. My thanks to Don Bradner, of www.datastormusers.com fame, for reviewing the following material. 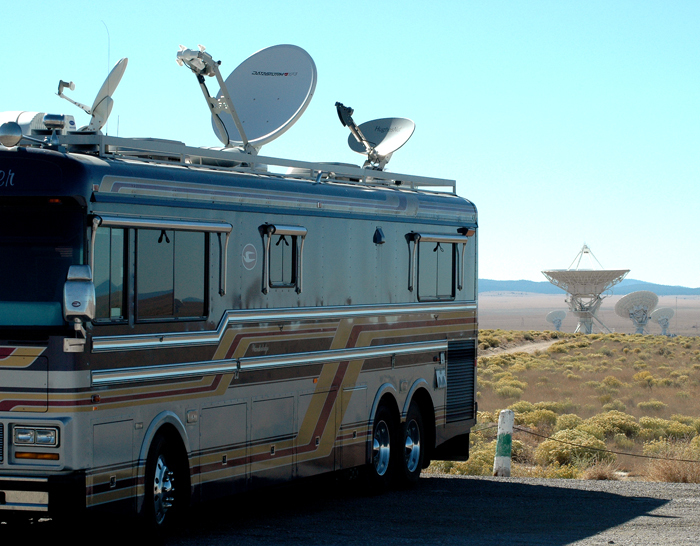 Satellite Internet for RVers came of age in the early 2000s with HughesNET — the original Ku-band HughesNET, not the Ka-band Gen 5 HughesNET. These Ku-band HugheNET dishes came in various sizes and shapes, generally from .74 M (28 in) to 1.2 M (47 in). Also, there were automatic rooftop dishes and ground-based tripod dishes for manual setup. A few months before my wife and I started full time RVing in May 2013, I purchased a DIRECWAY (that is, Ku-band HughesNET) tripod-based system from an RVer I met on one of the online forums. The system was more expensive to ship than to buy outright. I referred to my satellite system as the “steam punk of RVing”. I never used it, and in 2018 I had to throw away the system because no one would buy it. When Ku-band HughesNET satellite Internet (originally named DirecPC and then DIRECWAY) was introduced in the early 2000s, it provided Internet service for those who wanted something faster than dial-up phone connections and for those without cable modem access. Download speeds range from acceptable to incredible. Even though DIRECWAY product literature claims speeds of “up to 400Kbps downloads,” my average download speed is usually about 800Kbps. I’ve seen bursts of speed up to 1.2Mbps on individual downloads, and I’ve had sustained data transfers at 1Mbps or greater when simultaneously doing multiple downloads from different computers. Download speed is measured at the satellite adapter on the host computer. The history of the original HughesNET systems can be traced through the rise and fall of attendance at Datastorm.com user rallies. The 2008 Stock Market Crash might have played a part in the steep decline, but the original Ku-band HughesNET satellite Internet systems were on their way out as cellular 3G and then 4G broadband access use increased among RVers. 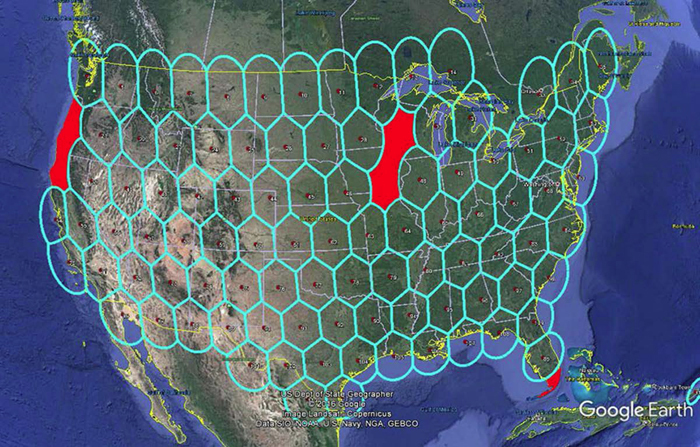 The nail in the coffin was the demise of Motosat, the manufacturer of rooftop Ku-band dishes. However, some of the original Ku-band HughesNET systems are still around. RVers, especially full timers or boondockers, like to have a “Plan B” for Internet access in case cellular service is not available. Nevertheless, cellular plans remain more cost effective than any current satellite-based Internet solution. Today’s Ku-band HughesNET (or iDirect) satellite systems are better than their predecessors and are able to reach download speeds of up to 10 Mbps (Mobile Satellite Technologies — iDirect metered service plan starting @ $499/mon requiring a 1.2 M dish). However, typical RV-affordable systems are much slower. 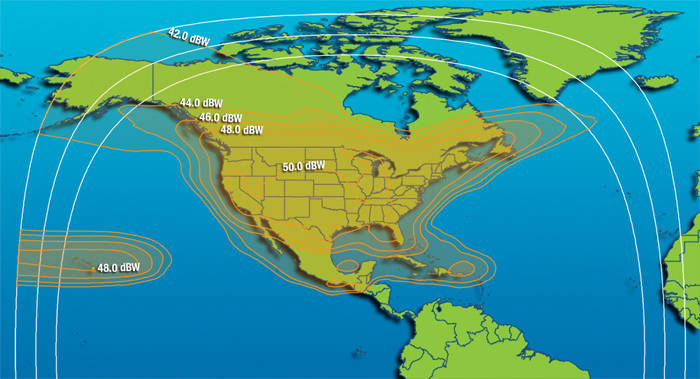 For example, the $6,495 rooftop RVDataSat 840 offers unlimited data iDirect Internet plans from $79.99 per month (1 Mbps) to $409.99 per month (2 Mbps). Enter Ka-band HughesNET Gen 5 high-speed satellite service in 2017 — 25 Mbps download with service plans starting at $89.99 (35 GB per month) to $389.99 (200 GB per month). However, this is for a tripod-based system. You’ll have to set it up manually each time you move, and the HughesNET Gen 5 dishes are large — .90 M (35 inches) or .98 M (38.5 inches). For you Prevost owners out there (ie, folks with a lot of money), there are rooftop automatic HTS solutions available. For example, the Ka-band .75 M Winegard WV750A (~ $17,000) uses Exede data plans from $225 per month (3 GB a month) to $28,745 per month (1.25 TB a month). Before looking at what satellite systems are available today, we should consider satellite coverage maps and EIRP (Equivalent Isotropically Radiated Power). The EIRP numbers in the iDirect coverage map are power ratings measured in dBW that are used to determine what sized dish you’ll need in each EIRP area. Notice that as you move North, the EIRP numbers get smaller. Power nearly doubles for every 3 dBW change in EIRP. For example, if you are in the 50 dBW part of the map and move to an area with 47 dBW EIRP, your equipment will now receive only half the power it had in the 50 dBW region. You can “get around” EIRP power loss by using bigger and bigger dishes. This is why many RVers opt for large (.98 or 1.2 M) dishes for travel into Canada or Alaska. I remember reading a RV thread in Datastorm.com forums from an Alaska-bound traveler using a .74 M Ku-band HughesNET dish. 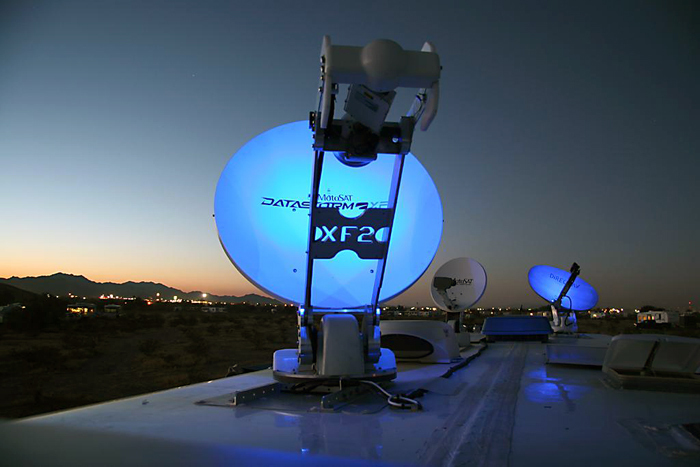 When he began his journey from the US border, he described how strong his satellite signal was. However, the more he ventured North, the weaker his signal became until he lost signal completely around Edmonton. 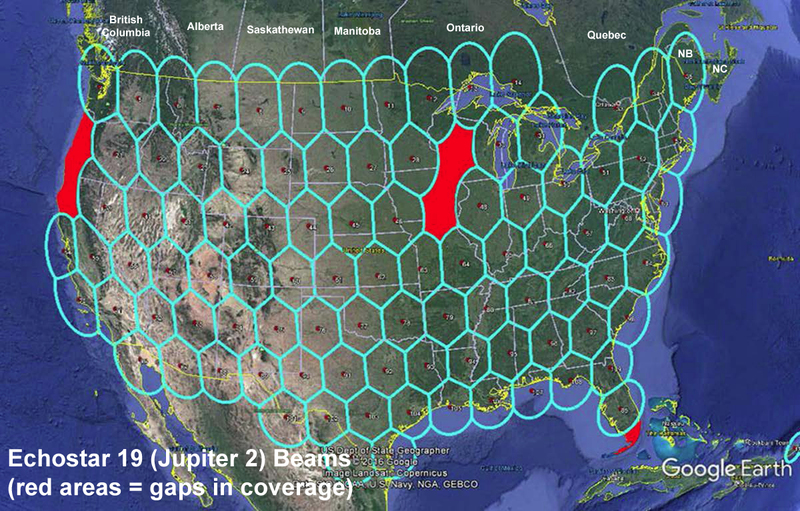 Nevertheless, coverage maps and EIRP levels are not an exact science, but estimates of satellite signal strength. Your mileage may vary.